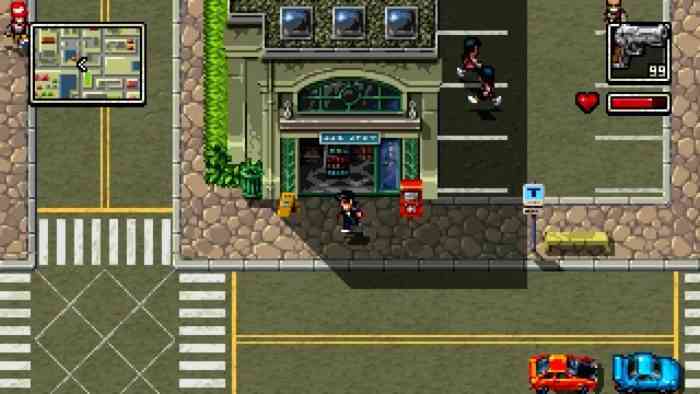 For something with so much resemblance to another game called Retro City Rampage, Shakedown: Hawaii feels quite forward-looking. Sure, there’s the retro graphics, retro music, retro controls, retro gameplay… and yes, there is also a retrograde sense of humor. But despite so much inspiration from the past, you would never mistake Shakedown: Hawaii for anything other than a modern game. This is an old school beat-em up game, the kind where you get points for doing damage and causing destruction. In Naughty Dog games you’re doing violence to further the plot, in Grand Theft Auto you’re doing violence for the love of the game, in Shakedown: Hawaii you’ve got a score ticker giving you points for every act of mayhem. Hit a car with your car? That’s points. Hit a person with your car? A bunch of points. Punch someone, shoot someone, light up a city block with a flamethrower? Points, points, and points. The combat in Shakedown: Hawaii is fairly simple. It’s played from a top-down perspective, and you’re one guy against a lot of enemies. The game isn’t about getting the longest combos or combining moves. You attack attack attack, and the dudes go down and your points go up. There’s definitely satisfaction in that. And there’s variety. Using your fists feels different from using a broom or a pipe. Using a pistol feels different from a machine gun or a rocket launcher. They all use the same button, but change the timing and projectile type in a way that effectively keeps you on your toes. Combat is going to have to be pristine in such a fight-heavy game, and I am pleased to report that combat feels good. Simplicity plays against the other half of gameplay. There’s a management game in Shakedown: Hawaii, and if you’ve played any open world game since Grand Theft Auto: San Andreas, you probably know what to expect. There’s territory to control and protect, civilians to shake down (hey! that’s the name of the game!). I love this idea. Management games and silly combat-heavy games are a chocolate and peanut butter idea. That’s what makes the Yakuza franchise so much fun. But while the combat side of things is stupid and engagement, the management side is less gripping. I found myself getting lost in the cabaret minigame in Yakuza 0 for hours. It combined an addictive mobile-like game with aesthetic customization options, RPG leveling up, and amazing conversation pieces. That last part is key. Shakedown: Hawaii doesn’t take itself seriously. On one level it kind of feels like a Saints Row game. Not the later ones that went completely off the rails with aliens and presidential elections. One of the ones where you were still in the big city, but you had to shoot poop and the enemy buildings. And Shakedown: Hawaii has it out for everyone. The game has it out for corporations and the empty suits who run them. It also has it out for lazy young people who just want handouts from their parents which they blow on sneakers they don’t need. There’s venom saved for game show hosts, game show contestants, and the people who watch game shows. The police are all brutal idiot pigs, and criminals are a bunch of gross scumbags. The thing is, if you have it out for everybody, you don’t really have a perspective. Sometimes South Park has a brilliant episode that takes down a deserving target, but if you watch fourteen consecutive seasons of South Park the takeaway is that nothing matters and everyone is an idiot for caring about anything. Shakedown: Hawaii manages to feel like a ten-season binge of South Park in just an hour or two. In comedy, there’s the concept of punching up and punching down. When you punch up you are targeting people, ideas, and systems higher up in the power structure. It’s what makes the government such a good target for jokes. It’s why a man making generalizations about women often resorts to self-deprecation. Because without the specificity of a certain perspective or experience, that sort of generalization can feel like punching down; taking refuge in the confidence and safety you feel from your standing in the culture. Shakedown: Hawaii does quite a bit of both. Which sort of describes the game in a nutshell. 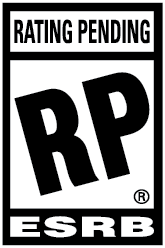 You play as characters who punch everyone and increase your points, regardless of who is getting hit. That attitude extends past the gameplay and into the writing. The game treats all targets as worthy of getting hit, the more damage done, the more points earned. And I’d be lying if I said I didn’t have a great time mindlessly bouncing around and causing as much destruction as I could. But once you stop to think about all the other parts of the game, you’re confronted with some uncomfortable questions. And something tells me those questions aren’t here by design.